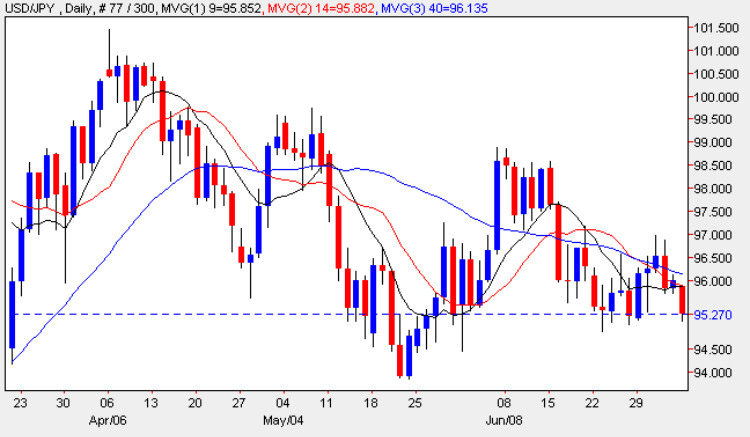 Friday’s candle for the yen to dollar currency pair provided us with little in the way of trading signals ending the session as a narrow spread doji squeezed between the 9 and 14 day moving averages. The general tone for the dollar yen remains bearish as it continues to slide ever closer to the pivotal 94 price point, as markets enter a phase of sustained risk aversion we may see market participants equally divided between the US Dollar and the Japanese Yen, both of which act as currencies of safe haven. With the Dollar Yen (and Yen crosses) positively correlating with the S&P500, should risk aversion continue to blight the equity markets in the next few weeks, then this should equate to a further fall in the dollar yen and should this be significant then the 94 handle may be breached sooner rather than later.